Roderick Bluh, Leader of Swindon Borough Council, must be happy today because, after years of failing to ‘Put Swindon On The Map’ – one of his favourite and oft repeated phrases, his ‘Getsignal WiFiasco’ has finally put the name ‘Swindon’ on the magazine stands and coffee tables of the Nation…. …..because his ‘visionary’ leadership has led to the town becoming known as being a ‘Rotten Borough’. Bluh’s ‘Getsignal’ project, a public/private partnership between Swindon Borough Council & Digital City (UK) Ltd has proved high;y contentious with the taxpaying residents of Swindon, partly because the details of Bluh’s WiFi ‘deal’ with local businessman John ‘Rikki’ Hunt were kept secret from 57 of Swindons 59 elected councillors by Cllr Bluh who was aided by a compliant corps of Council Officers. The reality of Bluh’s ‘Getsignal’ pRodject, just the latest in a long line of Bluh’s expensively failed vanity/legacy spends – always with public money and never his own – is that it has already swallowed £400,000 of Swindon taxpayers money and is several months behind schedule in completing even the first installation phase in the small town of Highworth . Highworth has 12,000 potential customers available to it but as of last month, Digital City (UK) Ltd had managed to entice only 12 of them into paying for it’s basic £5.99 perm month WiFi service. On those numbers it is obvious that Digital City cannot last much longer unless Bluh, or another clueless fool, decides to ‘lend’ it another huge wedge of public cash….which the public will never get back if the current performance of the pRodject doesn’t miraculously improve. 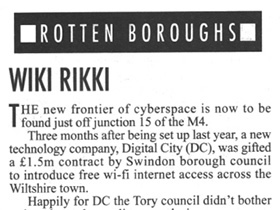 The entire Borough of Swindon was due to have been ‘WiFi’d by April 2010. Highworth is still waiting, Swindon is still waiting, the £400,000 taxpayer loan to Digital City has been collected in full by Mr Hunt, but where’s our WiFi ?